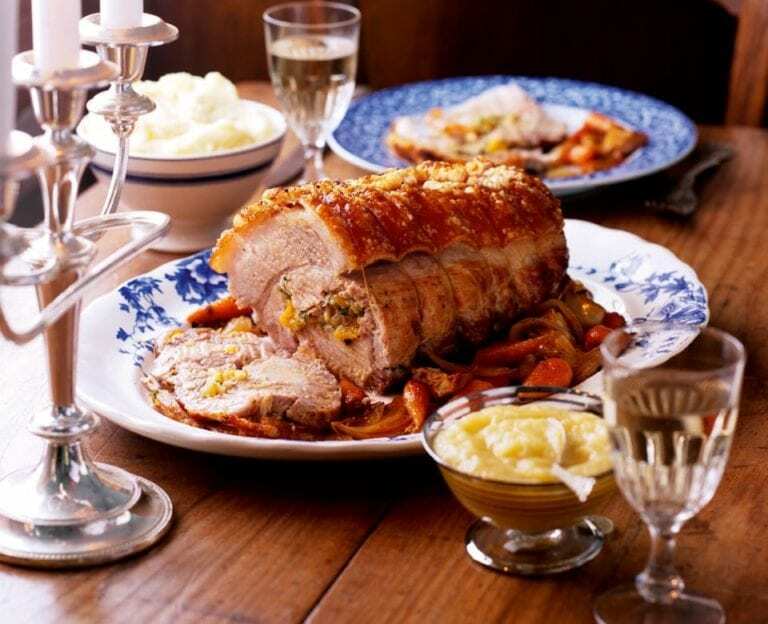 Apricots, shallots, pine nuts and sage all work wonderfully as a stuffing in this roast loin of pork recipe. Preheat the oven to 220°C/fan200°C/gas 7. Melt the butter in a frying pan over a low heat. Add the shallots and garlic, season and fry over a low heat for 5 minutes until soft but not coloured. Tip into a bowl and set aside to cool, before adding the sage, apricots, pine nuts, parsley and breadcrumbs. Mix and season to taste. Lay the pork loin out on a chopping board, skin-side down. Starting and finishing about 2cm from each end, cut a pocket into the pork loin about two-thirds of the way through and fill with the stuffing. Roll the loin around the stuffing and secure, at intervals, with kitchen string. Rub the skin with olive oil, sea salt and black pepper. Place the chopped onion, carrots and celeriac into the roasting tin, lay the pork on a rack on top and roast for 30 minutes. Turn the heat down to 190°C/fan170°C/gas 5, add the wine and 100ml of water to the roasting tin and roast for 1-1½ hours or until the pork is cooked through. Top up the roasting tin with a little more water during cooking. When the pork is cooked, allow it to rest for 10 minutes before serving. If the crackling isn’t crunchy enough, carefully remove it from the resting pork with a sharp knife and crisp it up under the grill. But watch it like a hawk so it doesn’t burn! Cut the pork into slices and serve with the roasted veg, Apple sauce (see recipe, right) and creamy mash, and drizzle over the pan juices. This pork loin can be stuffed and rolled the day before and kept in the fridge.